Come Enter! 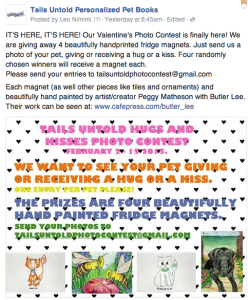 We have a new Tails Untold Personalized Pet Book Contest. 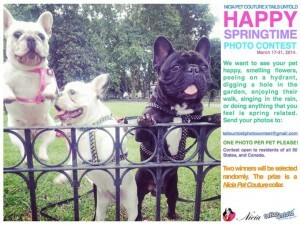 Come visit our Facebook page to enter our latest Tails Untold Personalized Pet Book Photo Contest to win a wonderful Nicia Pet Couture collar. Can’t wait to see all the entries! Please share with all your friends, too. 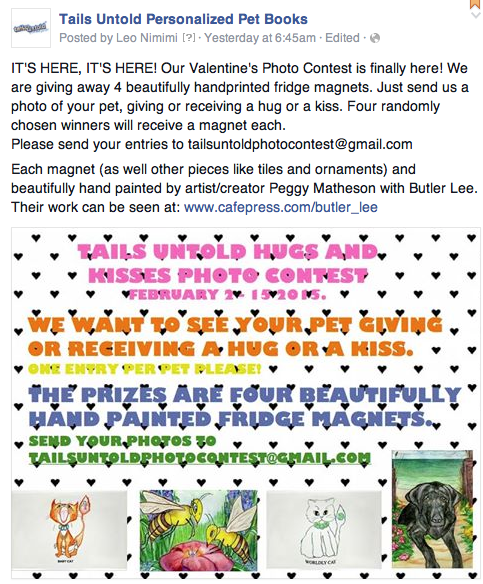 A Tails Untold Personalized Pet Book Facebook Photo Contest winner! Thank you so much for my gift from your photo contest. The Bark Box contained a lot of interesting goodies for my brudder Jimmie and I to enjoy. We appreciate the generous gift.